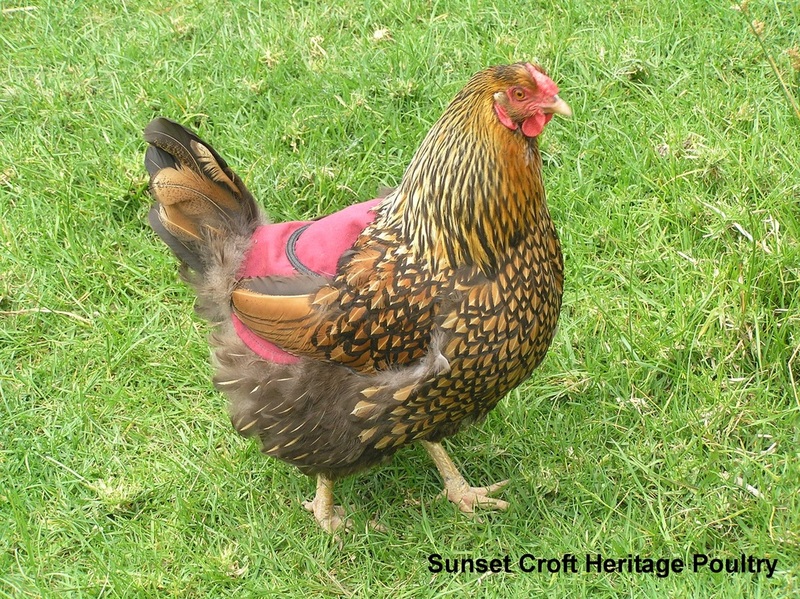 Roosters often have their favourite hens and with constant mounting, feathers get broken and backs can become bare and injured, particularly if the rooster has long spurs. It is best to fit a saddle as soon feather damage is obvious, before it becomes serious, and the hen may need to wear it for an entire season. They also protect against cold and sunburn to exposed skin and are ideal for keeping white birds clean. They may help prevent and control feather pecking and ex-battery hens may benefit from wearing these as they recover. The braid detail is not just for looks, but also serves as a non skid surface so the roosters can get a grip. Made in quick-drying, pre-shrunk cotton canvas and fully lined, these stay in place with two elastic straps which slip over the wings. Chickens don't mind wearing them at all after the initial uncertainly of having their jackets fitted and they don't become dislodged even during dust bathing or mating. LARGE for medium to heavy breeds. SMALL for light breeds such as Bantams and Silkies. Hi, I bought one of your saddles, and just want to say thank you. I can't believe how well it fits and it is a real relief to know my chicken's back is covered and her feathers can grow back. Thanks very much. Saddles have arrived and I am very impressed with the quality and design, so thank you! I bought saddles from you this season. They were great. Thank you so much for the saddle - it is working really well! Could I get two more saddles please? Thank you very much. I received saddles, looks nice, recommend to all who need them. Great trade. 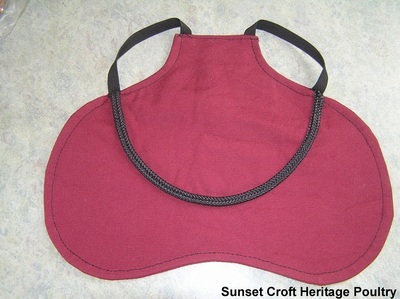 Poultry saddle well made and hen will benefit greatly from wearing this. Many thanks. Copyright © 2014 - 2019 Sunset Croft.